The life of the artist. To most who know me I am just ‘Dee’, but in fact I was born Diarmid Ewen Cameron Doody in what was Bulawayo, Southern Rhodesia in 1952, and spent my early years with my brother Edward John, mother Kitty and father John. During World War II, my mother had worked for the U.N. in Cairo, and my father had been in the Palestine Police throughout the Arab revolt, and later patrolled the Red Sea attempting to stamp out the slave trade as well as being involved in contraband control in the Aegean. Following the death of my brother, I spent a lot of time with my father travelling into the game reserves on photographic expeditions to film species such as Lion, Giraffe, Impala, Elephants, Rhinos, and all the other species that were so much more abundant then. I remember doing things you just don’t do in Britain, like feeding orphaned baby Elephants by bottle, watching Crowned Cranes displaying and Impala males fighting to the death. These were important times for me and sparked off the long standing love affair with nature that I have to this day. At the age of eight I left South Africa and we sailed to Australia, New Zealand, Fiji, Tahiti and across the Pacific to Panama and then on to the UK. My arrival in Liverpool in winter was a shock! Sadly, my father died when I was eight, and after some moving about, my mother and I settled in Sevenoaks in Kent, where an interest in British wildlife began. I would go off on many field trips to places like Sheppey, Dungeness and cliff pools with 4am starts in an old Lotus Seven to be on site at dawn for Harriers, Short-eared Owls, Snow Buntings etc. Brilliant birding! Soon I was married and raising children. I was working mainly in London doing design and exhibition work of various kinds, but then gave it up to design and make children’s rocking chairs. In 1982 I applied for and obtained for a contract to study the beautiful, rare and elusive Merlin in the hills of Wales for the R.S.P.B. and this work continued for many years. As well as working on Merlins, I was asked to help on Peregrines, Red Kites and Goshawks, climbing to the nests to mark eggs and ring chicks as well as guard many of the nests. In 1989, after working on Red Kites in Wales, I was asked to go to Scotland and re-introduce the very first Red Kites back into the highlands of Scotland. These were birds donated by Sweden to both the English and Scottish release programmes, but sadly the Scottish birds on the Black Isle will always, I imagine, suffer from ‘unpopularity’ in a game rearing area. After this I became involved in setting up CCTV cameras in Wales as part of a study into poor breeding amongst Welsh Kites, and later in Scotland for the public to see into nests of Kites, Goshawks and Ospreys. 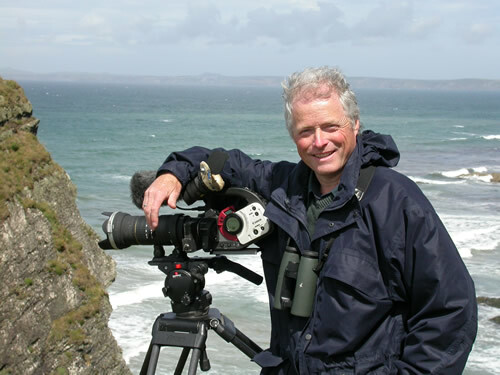 Soon I was asked by ITV to be the presenter of wildlife programmes and I offered to do the wildlife filming that went into the series as well. This rash move led to my becoming a full time wildlife cameraman. I currently paint for a number of galleries in England and Wales using oils and acrylics. I live and works near the quaint old town of Llanidloes that lies in the beautiful hills of mid Wales, surrounded by breathtaking views, tumbling rivers, oak and pine forests and lies on, and close to the very source of, the River Severn. Here I paint the images I want to create, mainly the animals that inspired me as a child - Lions, Bengal and Siberian Tigers, Snow Leopards, Elephants. Rhinos - as well as birds of prey, dolphins, orchids - in fact any wildlife at all. In the Summer, I have a marquee erected at Gigrin Farm Kite Feeding Centre near Rhayader in mid Wales, where you can meet me and see my works (if I am not away demonstrating!). If you want to be sure of catching me, do contact Gigrin Farm beforehand (details on ‘Links’ page). For the ideas and references that I need, I spend as much time as possible travelling abroad as well as visiting zoos and big cat sanctuaries.